The Lesson Schedules function on LDS.org was discontinued December 31, 2016. The menu item for “Lesson Schedules” no longer appears on LDS.org. Lesson Schedules (lds.org/lesson) is a function on LDS.org that wards and branches can use to post the schedule of priesthood and auxiliary lessons. It is an online place where members can see which lesson will be taught each Sunday. It is a good idea in theory, but here’s the problem—only 750 of the Church’s 30,000 wards and branches use it. Here’s the next problem—it has several technical problems that frustrate users, which aren’t easy to fix because the system runs on old technology that would need to be updated. A cost-benefit analysis showed it was too expensive to update, given that so few wards and branches actually use it. Our ward prints a small bookmark at the beginning of the year and gives a copy to each member. One side lists the schedule of Gospel Doctrine lessons and the other side lists the lessons for Melchizedek Priesthood and Relief Society. Some wards list in the weekly announcements (often distributed with the sacrament meeting program) the lesson schedules for the current and upcoming weeks. The Ward Calendar (on LDS.org and in the LDS Tools mobile app) lets you set up various calendars for specific purposes. You could create a calendar for Lesson Schedules and enter the lesson titles, such as “Gospel Doctrine: Lesson 13” or “Relief Society: Teachings of Presidents of the Church: Gordon B. Hinckley, Lesson 3” on each Sunday. Then, inform ward members about this calendar, which is easy to turn on or off when you view the calendar to separate it from other ward events. If different teachers teach the class from week to week, the appointment could also list the name of the teacher. The description won’t allow you to enter a link to the actual lesson, but people should be able to find it from the lesson number. Some wards may find it more convenient to list all the lessons in a Word document and post it in a shared location, such as on Facebook, Google Docs, or Dropbox. (These are all free services.) To make it easy for your ward members to find, you could use a free service such as bit.ly to create a short URL that is easy to type. You could then publish that URL in your weekly announcements. If you use online resources, please refer to the Church guidelines at internet.lds.org. An alternate solution might be to post appointments for each class on the ward calendar in LDS Tools with a link to the lesson reading assignment. And if different teachers teach the class from week to week, the teacher assignments could also be listed in the appointment. James, I’ve incorporated your good suggestions in the post above. You cannot find the lesson schedules from LDS Tools now either. Any alternative approach wouldn’t make the situation any worse. If one wishes to use LDS approved service, maybe using the Newsletter (lds.org/member-news) is an option. I like the suggestion of using the calendar though, too. James, I agree with you that the Calendar is the probably the best solution inside LDS.org, but that’s only because to discontinue ‘Lesson Schedules’ is creating a problem where there isn’t one. Have you tried using the Calendar? Talk about an antiquated piece of software, poor user interface, hard to navigate. This comes from me trying to populate my 2017 Lesson Schedules after reading your comments above. Today Sunday Jan 8, 2017. I spent some time populating the entire 2017 Lesson Schedule year, at the end of my work I found a notice saying that the ‘Lesson Schedule’ was being discontinued as of Dec 31, 2016. I thought that was strange as I had just used it in 2017, after the cut-off date. I sent a feedback request through the LDS.org site asking for a response about supposed discontinuation. Sure enough they said it was going bye-bye. They provide a link to this blog as a resource for updates/instructions on all things LDS Tech. After reading the comments here is appears that the users of the ‘Lesson Schedule’ are AVID users and ADVOCATES. Seems to me that the REAL PROBLEM is not in adoption (cost benefit of users vs total church unit population) but a PROBLEM of AWARENESS and LACK of TRAINING. If the Official LDS.org support team is directing me to an ‘unofficial’ church website – they were very clear about the UNofficial part in their email – then they seem to be lacking in the INTERNAL resources to support/train/communicate about the system THEY have developed. – Side note, this is a very helpful site by-the-way. Let’s face it, this is a big ship we are on, and it’s a slow moving vehicle. Whenever you have to change course (tech advancements), making the turn in a new direction, a better direction, a direction with less friction – cause lets face it, that’s what it all about, making things easier – it takes TIME for mass adoption to occur. Someone down the post asked about training videos, that’s a great idea. Last year I made screencast videos on how to use ‘Lesson Schedules’ and how to report ‘Home Teaching’ on LDS.org so my councilors could learn the system. Then our ward was re-organized and I had new councilors and the videos came in handy for the new guys to get up to speed. I understand that the site is a ‘work-in-progress’ and it’s made great advancements in making church life easier, but the BIG QUESTION is – WHERE ARE the PRIORITIES? I just found out that the church has a dedicated website to Church Owned Recreational Properties. Camping.lds.org – and maybe the site was made by volunteers, but I’d imagine some church resources go towards it. The bottom line for me is that the following things need to be facilitated in a DIGITAL, BROWSER based (or app based) solution provided by the OFFICIAL church website. If anyone can tell me if there is an OFFICIAL place to submit feedback/development requests, or to see other peoples requests/thoughts/suggestions for improvements to the church resources, please let me know. Also is there an online training resource for how to get the best use out of LDS.org (LDStools, etc). Please add it to this post. Or, everything can just be posted on the RS facebook page, like my ward does, leaving out all of us who do not use facebook. How about this… Replace the current Lesson Schedule feature with a customizable link that will take ward members to the published doc (google doc, facebook page, etc) of where the lesson schedule is posted? This would be extremely simple for your developers to implement, and would allow ward members to continue going to the same place to find out the lesson schedule. I am so sad to hear that they are stopping the LDS Lesson schedules. This feels like a major step backwards. I was really hoping that we would soon have the lessons in the LDS Library Application. Leaving a link to the ward website would be a nice alternative. Seems like something that could easily show in LDS Library as well and at least open your browser without big database cost. I really wish this wasn’t going away, it was very easy to autofill in all the class lessons and have them populate around other events like Ward, Stake and General Conference and type in the teachers with it pulling from people in your ward. Perhaps if it were not prone to issues and the availability was known significantly more wards and branches would incorporate it. The alternatives push organizations out of the approved site that the Church established to avoid multiple web pages and social media outlets from become official sites for Ward information. I agree with Frank. I have been trying for years to get people in the ward to use the church website FIRST. I think it is a great resource and have been telling people that the brethren of the church have spent a lot of time and money to create such wonderful resources we should use them. I just taught four people in my relief society class about 4 months ago how to get in and they LOVED it. I think wards just need to have a 5th Sunday class on how to use the technology that the church provides. It is so hard to have to go find the bulletin or get on facebook or elsewhere to find everything when it could all be done on lds.org. I never had any problems with the lesson schedule links and loved having it at my fingertips. It was so helpful especially when needing a substitute last minute. I hope the brethren reconsider. I think it would be worth the time and effort, I like to go to the source, I like the direct info from the church. I will miss the lesson schedule. But as one of only a small handful of units using the tool, I understand the decision. The Newsletter has similar technical problems and there are only 550 wards and branches (out of 30,000) that use the Newsletter. Therefore, will will be discontinued as well. We will announce that within a few weeks. I am not sure that the cost-benefit analysis presented is accurate. How many wards and branches use LDS.org for their leadership services? It cannot be all 30,000. If one were to compare the number of wards that use the Lesson Schedule to the number that use the Home Teaching Tool, I would think that the cost-benefit would change significantly. Further, I do not remember the Church pushing the Lesson Schedule Tool so too few leaders knew how about it, let alone how to have their members use it. I had to spend several weeks getting my HP Group comfortable with the tool, but now it is invaluable to us. I then had to get the EQ and RS comfortable with it. That takes time. But printed materials are more wasteful (and basically obsolete) than any cost needed to upgrade the Tool. Please reconsider. Please. I like the suggestion to put the following week’s lessons in the sacrament meeting program. The sacrament program is an under-appreciated resource sometimes. I’m curious what the statistics are for number of wards that use the LDS.org Newsletter. That also hasn’t been updated for a while and has similar issues. I wouldn’t be surprised to see it go away, as resources haven’t been put forward to make it successful. You are correct about the Newsletter. There are only 550 wards and branches (out of 30,000) that use the Newsletter. There are also technical problems with it, and rather than spend the money to fix it, we will discontinue it. We will announce that within a few weeks. I’m even more sad that Newsletter is going away. My stake publishes the Stake Conference talks there. I agree with the earlier comments, we finally got the HP EQ and RS trained to use it, and now it’s going away with no real alternative. The point about the cost/benefit analysis is valid, how many of the 30,000 units use any of the online sites? I have never had an issues with the site, and it does not cost anything to keep it without support until an alternative site can be created. Before we started using it, the RS would be reaching one lesson and the HP teaching another while the EQ is teach something else. Now we are scrambling to come up with something else. I don’t have time for this. I too ask that the Lesson Schedule remain for those of us that rely on it to keep everyone on the same lesson. Please. I find the rationalization of the decision to scrap this Lesson Schedule system to be very weak at best. It works just fine for those of us who use it. Just leave it there if the cost benefit is too great, which I find to be a weak excuse coming from the IT world myself. I think much of the doctrine in the church teaches to go and look after the lost sheep. The lost sheep are using this Lesson Schedule. I agree with those above who have stated that all the solutions above take you away from the site and not draw you in. If as much time was spent on making members aware of the program as opposed to making them aware it is being shut down, your percentage of usage would jump dramatically. The Supreme Court changed the marriage laws to accommodate a lower percentage of people ( less than 2%) of the population. The goal of LDS.org should be to bring members in and provide services within the site to make their callings and membership easier as the Lesson Schedule has done, not to provide a good solution and then pull it away from them regardless of how many are using it. Please keep the Lesson Schedule. One stake (and their wards) has each created a Lessons Schedule calendar in the Calendar tool. There they put all the lessons. 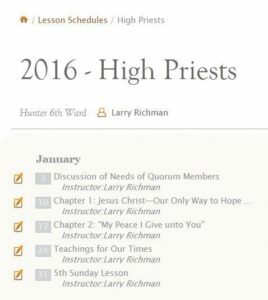 Members can easily subscribe to this calendar along with others they have and see the lesson for each Sunday for each class. It is working fine. The Calendar tool is much more clunky then the purpose built tool that auto populated and had the members from the ward for who was teaching the lesson. It would be nice if the church or someone made a downloadable template with all the links and lesson in a spreadsheet or google doc that could easily be modified. Then a static repeating link could be made in the calendar. Hopefully more training videos will be made next time around and put with the lessons schedule for wider adoption. New things can be scary at first for people but most everyone seems to have a phone or a tablet in our ward at this point since you can get a tablet from Amazon for $40 now. Thank you and the LDS IT employees and volunteers for all that you do — love the enhancements to LCR and scripture apps. Perhaps it hadn’t been widely adopted in part because of the “technical problems that frustrate users.” I suppose the CBA didn’t take that into account. We used it in our EQ as a way to let the members know what lesson to look study and as a way for my counselors and I to know who had been assigned the lesson and that it had actually been assigned. We had just gotten the RS, HP and Sunday School to adopt it when suddenly the rug got pulled out from under us. Please spend more time educating us on the available resources. I had no idea that there was a lesson planner, newsletter, or campsite tools. And now I just accidentally stumbled upon a Personal Progress Tool. What a blessing this could be for our YW Leaders who are struggling to keep up. Is there also one for the Duty to God? Also is there a place that can show me what tools are available for each organization? Please find a better way to inform us of these options. Thank you for your service. Glad you find LDS MediaTalk.com helpful. That’s my purpose to let people know about all the great things the Church provides. To answer your question, there is no tracking app for Duty to God, like there is for Personal Progress.